Wow. So, today is CRAZY TROJAN DAY!!! We had a spirit week for homecoming, (the dance was CANCLED due to lack of participation. What a disapointment.) and today was the only day I dressed up. 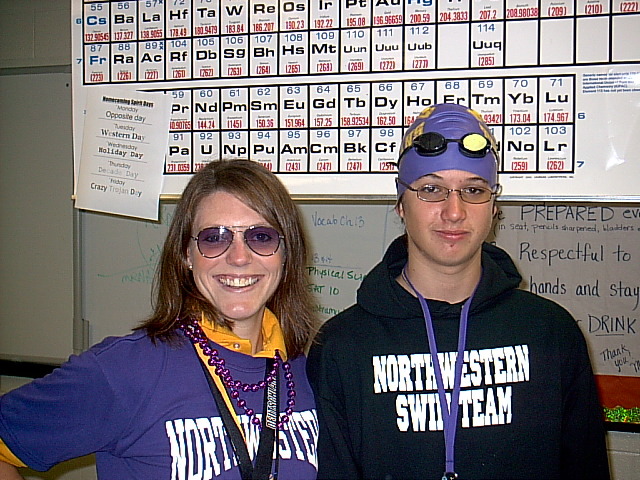 Since I was on the swim team, and because I'm SO serious about swimming, I wore a swimcap and goggles all day. Here I am with some Band kids after school. In the back is a friend that I actually met in Clemson this summer. He's insane. So, yeah. 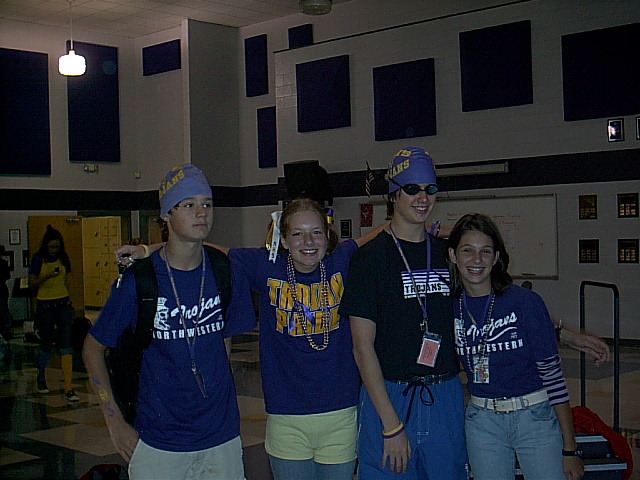 I'm pretty sure that I had the most CRAZY spirit in school, other than AJ, but he didn't actually want to. I made him. And he enjoyed it! When I was walking through the crowd of people who were outside after second block, someone shouted, "Look! That kid's wearing a condom on his head!" 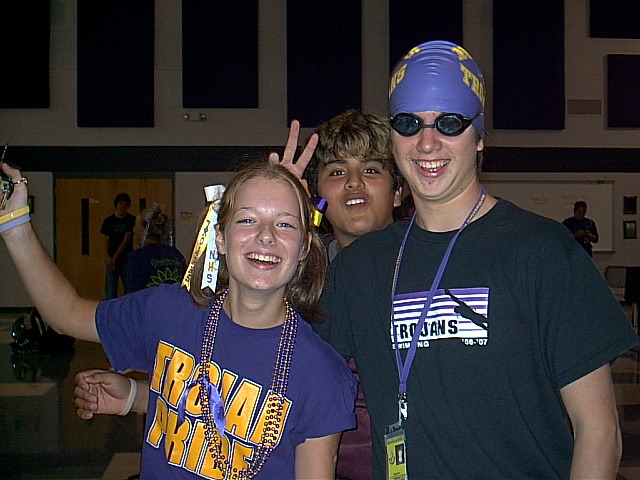 I was like, "Yeah, I bought a big, purple condom at the gas station that says NHS TROJANS on it. Yeah." And then it hit me. Trojans. Condom. AHHHHHH!!! Well, I joined the Rays swim team to stay in tip top shape, or even better, for summer league and next year. *in a crappy accent* I think it's safe to say that I'm getting pretty serious about swimming. *kisses arm* Lol, really though, I just don't want to lose the edge that I gained through my hard work with highschool. (Which ended way too soon.) Rays is pretty fun; there are some swimmers in our group from different schools, but most are from my school team. Our group is even being coached by Sue, who was out coach and will be my biology teacher next semester. She's pretty awesome. I'll only be swimming on Mondays, Tuesdays, and Thursdays. I might deviate to match my schedule. Who thinks that I should post more pictures?